Designed & decorated locally in Wales. Here, we offer a collectable range of beautifully decorated fairy doors to place on your skirting board at home or in your garden. Let the magic of fairyland through to our world. All you need is imagination...Fairy doors are a unique way for children to use their imagination and role play skills. They can spend hours making up stories of fairies and elves and their magical land beyond the wall. 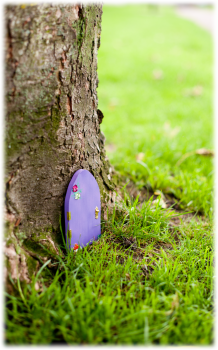 Playing with friends or alone they will enjoy and treasure their very own fairy door. The handcrafted doors make beautiful decorations for any home and make wonderful gifts.You’re never too old to bring a little sparkle into your life! There are doors for inside and outside. The outdoor ones can be placed on decking steps, a wall or on a tree trunk & also used in the home if preferred instead of an opening door. You can also purchase fairy dust here and small gifts that could be left by the fairies ready to treat your child and to enjoy the full experience of surprise and wonder. All doors measuring approximately 10cm in length and 7.5cm in height & are made of high quality wood. These doors are a lovely decoration to any bedroom, home or garden - bringing magic and brightening your day! On special occasions the fairies and elves leave gifts by the door - for celebrations and achievements of any kind.You can organise a fairy hunt or trail in your garden with miniature wands, glitter and lovely surprises along the way. You can leave a message from the fairy at any time by the door - 'santa is checking you are being good', 'well done for being brave', 'congratulations', 'happy birthday' etc. Just enjoy! Fairydoorz logo is a registered trademark.